Why there’s never been a better time to get at least one positive Google review! So you’ve claimed your business listing, included some attractive pics and ensured you’ve got the right business category, opening times and NAP (company Name, Address and Phone) info. You’ve even managed to get some great reviews with some great feedback. So that’s GoogleMyBusiness done, right? Wrong! There are lots more you can do and here are three things most companies overlook. If you type in your company name (and also your location for multi site companies) into a Google search on a desktop or laptop you’ll generally be presented with Adwords and organic listings on the left and your own ‘Company Pack’ on the right (see image below). On a mobile device search then this Company Pack frequently dominates the search with it coming up first; on Android devices at least (see image below). Given this prominence, it makes sense to give the best possible impression for something that isn’t your website and yet in many search scenarios is seen long before they get to your site! Moreover, it turns out there’s a lot you can do to enhance and add to this pack to improve this incredibly valuable real estate for you. Most clients I work with understandably worry about the almost inevitable bad review that they’ll receive at some point in the company’s life and how to respond to it. What none of them ever worry about is responding to the great reviews. This is a missed opportunity. It obviously demonstrates to both Google and your existing clients that you’re a responsive company and that you value their comments, regardless of the feedback you receive. However, it also gives you the chance to explain how you ensure that great service or product is made consistently great. You don’t have to labour the issue but you can give an insight into the process or attention to detail that your customers may be unaware of. Say for instance you hire out cars. If someone says what an excellent car they picked up from you then perhaps you can mention the 38 point check you do before a car goes out on hire. You might not, however, want to list out all 38 points! So you’re held in high regard by reviews on Google, what if you’re also great on Facebook, 118, Yell, Checkatrade etc. In that case, ensure that your NAP data is consistent and you verify where needed. For instance, have you verified your Facebook company page? Very few companies do! In due course, you should start to see these summaries beginning to start populating your GMB underneath your address and opening hours. Ideally, look to get at least two other review channels to start registering here to assist in banishing the ‘Competitor Pack’ from appearing (more about this below). 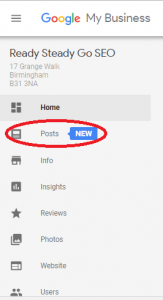 In the last fortnight, Google has introduced a new Post item to your Google My Business console (see image below). This is an incredibly powerful opportunity to sell your brand which shouldn’t be overlooked. After all, the rest of your information you provide in the Google My Business profile is quite neutral data whereas this gives you a genuine opportunity to sell your company and what distinguishes you from the competition. What happens when you do all of this? Well, first and foremost you increase the real estate of your page and undoubtedly make any prospect feel more favourably towards progressing to visiting your website or even calling straight away. However, there is another more hidden and yet just as important benefit from this. You may have noticed that for most GMB profiles, where you’ve used your exact address, that something unexpected and irksome happens. Despite the fact that for most GMB profiles your Company Pack will only turn up if you type your company name Google decides that if a prospect is looking on a laptop or desktop that this prospect would also like to know about your competitors, the so-called ‘Competitor Pack’. You’ll notice that at the bottom of your company pack also shows 5 potential competitors under the heading ‘People also search for’. So how can you get rid of this? Well follow the three steps above and you should be able to banish this irritating ‘Competitor Pack’ from your company pack whilst maximising your company image. See the example below. So implementing these steps is a win win for you. You may have noticed a drop off in your internet traffic since the end of February. What might have caused this? Has Google updated its algorithm? Have you received a Google penalty? Will you need to get your web designer or SEO specialist to look into what the problem might be? Or is it something a lot more obvious that staring you in the face? It’s just possible that you hadn’t noticed that your Google local listing review visibility got a whole lot more visible. It might have escaped your attention but did escape the attention of your prospects? Up till late last month, the star rating system for listings only showed your star rating out of 5 a maximum of 5 stars if you had a minimum of five reviews already. This made poorly reviewed companies quite insulated from a poor review profile. The first image, before the change, actually had four five-star reviews, but could just have easily hidden four very damaging number of poor reviews. After the change, as in the second image, it’s clear whether a company has good or bad reviews, even if it’s only one review. The change makes poor reviews become a lot more visible and potentially a lot more damaging. Particularly if you happen to have had one poor Google review from one particularly aggrieved customer; and let’s face it, it’s fair to say that generally, the most motived reviewers are those that feel considerably negatively towards you. Many business owners can get obsessed with their own website’s performance or for that matter the social platforms they also have under their control but your Google local listing can be more important than any of these. Why? Because it often gets seen first. Why? Because unless your prospect was searching for you then there’s a good chance they’ll see on a Google search is a, after the Adwords, a local listing before the organic listings that most companies get hung up about. Of course, you could argue that yes a bad review there might be bad for people searching for my services but most of my work comes from referrals. Well, in that case, it’s still a problem. If they’re on the web and they don’t know your web address then they’ll search for you by company name. In which case they’ll see your company listing on Google on the right-hand side and guess what. That bad Google review will be following you around in your prospect’s faces before they choose to proceed, or not to proceed, to your website. However, you may be in the position where you don’t have any reviews. Nothing good or bad. Sounds OK but of course, this leaves you just one heartbeat from a bad review. Might be a great time to start harvesting lots of positive reviews from your clients? On the other hand, you may have several good reviews, it’s a safer position to be in but again you’re still open to several bad reviews spoiling that. So what’s the answer? The answer is to have an on-going campaign of seeking to maximise the good will that comes your, or for that matter your staff, every day. Don’t wait for someone to maybe leave a good, bad or less likely indifferent review. Instead, leap upon all the positivity that is generated. If someone is singing your praises then provide them with the opportunity to leave a review in as simple and easy way possible. The great thing about harvesting all the positive feedback you receive is not just simply the way to demonstrate and promote your company or to head off any negative reviews coming your way. It also allows you the chance to create a virtuous circle. For every review created, regardless of it being good or bad, you can respond. For good reviews, you have the opportunity to explain how you ensure a great service in a particular instance. For bad reviews, it gives you the chance to show you care and how you may wish to redress any issues the client has. From this perspective, there is no bad thing as a bad review, but a person browsing your profile may not drill down to see your response and simply take the negative review on face value. This will largely depend on the scale of bad reviews. If you’d like to know more about the services that Ready Steady Go SEO can offer, then visit our reputation management or local SEO pages. This is not a rare situation that I find some prospects in and sometimes it’s only when I conduct a free situation report for them that they are aware of the scale of such an issue. It’s not entirely surprising with so many social media channels and for that matter, directories offering a review option it can be a task seeing what a company’s reputation profile might be. I also weight this up when suggesting to work with a prospect because if a company isn’t that bothered about this issue it makes SEO a lot harder to accomplish. In fact, gaining greater exposure for such an organisation can often end up amplifying the channels for dissatisfied customers to vent their dissatisfaction. However, in saying this, it true to say that normally the only motivated people who leave reviews are more generally those who feel negatively about the service they’ve received or how their initial complaint was dealt with. What most companies don’t realise that their reputation isn’t purely something they are powerless to influence. In fact, you may be surprised just how much you can affect your online reputation through a simple three-step plan to address poor reviews and harnessing a system to gain more positive reviews. This won’t always be an option, for instance, they might not respond to your contact or you may feel things are beyond salvaging. However, it’s my experience that if you’re prepared to make the effort to contact them and have a solution in mind to address their issue they may even feel inclined to remove or change the review. However, you should never have that as your objective since it will be obvious that is what you’re trying to do. Getting an ex-client to reconsider how they feel about your company and possibly re-appraise their future usage should be goal enough. You can only hope that the solution you have in mind impresses them sufficiently that they may consider editing or removing the bad review. Not all but some of the review sites give a chance for you to respond to a review. As a matter of principle if this is the situation you should reply to any review since anyway. Why? Because it shows that you are a responsive organisation that is keen to take the time to thank people for positive reviews whilst addressing bad reviews explaining what you did or intend to do from what you have learnt. However, you may not want to do this till you’ve tried approaching them directly. One word of warning is that it is vital to be as matter of fact as possible and not to try to belittle the complaint or use emotional language wherever possible. It is rare, but the are occasions where say a competitor, may leave a fraudulent review. Generally, with sufficient due diligence, you’ll find that almost all bad reviews are genuine. If you are positive that the review is fake then approach the review site directly but don’t make a habit of it since you may end up building a poor reputation with the review sites! Yes, I can see the irony in that too. And how do I get good reviews? For any company that hasn’t gone through this task, they may find a backlog of historical reviews to either address or are deemed ‘ancient history’. The good news is that almost without exception review sites work on posting the most recent reviews first. This gives any organisation a great opportunity to make a real impact to their future online reputation from today onwards. Of course, in saying that, many sites operate aggregate star systems or histograms so it may be a slog with some but getting good reviews is easier than it may seem. Moving forwards, as you build up more and more positive reviews you will gradually dilute the negative reviews and of course how long will very much depend on your current online reputation. Most people who are harbouring a complaint have to go out of their way to find your presence on a website for them to vent their spleen. The corollary of this argument is when you or your staff receive someone paying you a compliment then make them aware they can review you. That’s right, it’s as simple as that; make it easy for people who feel positively about the service they’ve received to leave a review. The best way to build on this positive spirit is to act on it straight away. I’ll often devise an e-mail template for clients outlining all the different channels a customer can leave a review straight after speaking or simply have it written on a business card that they can physically hand over to them. The secret is to make it as easy as possible. Don’t leave them with just the one social channel where they can leave a review. What if they aren’t already on that channel? Generally, the only people who’ll go out of their way to register will be those motivated by a perceived injustice! Of course, some channels are more valuable than others. For instance Google+ reviews I would say to most businesses should be a priority since in any Google search that brings up local listings your reviews will come up even before the organic listings (even if you’re at the top organically you’ll still be below these). Moreover, the more you can get on this the more influential your coverage can become so to get more of these than, say Facebook reviews, then I would simply put them in order of desirability to suit that need. You might say, for even-handedness, why not also give out your review details to someone who is complaining as well. My argument to this is that wouldn’t you expect either that you or your staff would actively handle the complaint there and then and in most cases to a satisfactory resolution. At that point, you could always give out a card at that point if you were so inclined. I hope that this has proved how that almost all businesses can gain positive reviews very quickly. As a word of warning, I would advise caution if you’re thinking of offering inducements to obtain favourable reviews. If you begin to get reviews of your site where people report of you trying to gain positive reviews for rewards then you may be penalised. You may want to stress that their opinion is valued whatever the response. However, the best inducement to gaining positive reviews I find is simply to make the process as easy as possible! If you’d like any help in restoring a tarnished online reputation or simply gaining one at all then don’t hesitate to contact me and, of course, all feedback is very welcome! 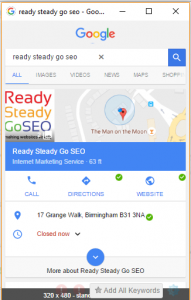 Ready Steady Go SEO is a new Internet marketing service consultancy that believes that search engine marketing for SMEs can be done differently. We're a results and project driven organisation that is focused on delivering significant ROI to SMEs.